Blood pressure above 140/90 in the official medicine is considered to be elevated. The human condition in these figures the doctors call hypertension. Factors that provoke its development are many, but among them are prevalent, occurring more often than others. To know what is elevated blood pressure, it is necessary in order to prevent or eliminate the possibility of these reasons. Stress are one of the leading factors of high blood pressure. When negative emotional experiences, stress, fear, anxiety unique system of the body produces the release of biologically active substances that help to cope with the situation or circumstances (here we have to say, first and foremost, about the distraction factor). We are talking about adrenaline, noradrenaline, dopamine, etc., these agents inevitably increase the level of blood pressure. In cases when it comes to hypertension, stress can be attributed to lack of sleep and chaotic routine. With age the arteries characteristic loss of the natural flexibility and elasticity. As a result, the lumen of the vessels decreases, which inevitably leads to irregularities in blood flow. The blood has to overcome tremendous resistance, which leads to hypertension. I do not mean a couple of extra pounds, but excess weight in the stage of "Obese" or very close to this phase. Excess weight creates stress on the entire body. Particularly affected are the heart and blood vessels. "The ardent motor" has to pass through a significantly large volumes of blood, it gets into the blood vessels under higher pressure than in people with normal weight. In addition, almost 95% of the cases this phenomenon is accompanied by hypercholesterolemia – increased cholesterol levels in the blood, significantly increases the risk of atherosclerosis. The decrease in body weight of only 1 kg (obesity) can reduce pressure by 1 mm Hg.St. The human body needs movement not less than in oxygen. Its lack provokes violations in the work of many organs and systems. The heart weakens, its reduction becomes sluggish, the vessels lose elasticity (because of regular training leading to the intake of oxygen, no). In addition, the metabolism, which in turn leads to rapid weight gain and, without timely action, to obesity. 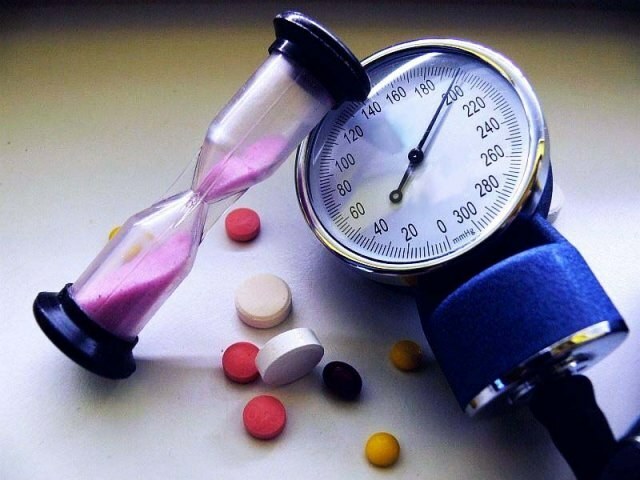 As you know, all this taken together inevitable launches an interrelated chain of interrelated processes that lead to the development of hypertension. Smoking. Nicotine entering the body, constricts blood vessels, affects the adrenal glands which in turn secrete adrenaline causes the heart to beat faster (i.e., the conditions of increased load on the heart that when the narrowing of blood vessels is very dangerous). Smokers by 15% decreases the content of oxygen in the blood. Alcohol. The abuse of alcohol-containing beverages provokes increased sensitivity of the organism to stress, reduces the ability to recover rapidly. In addition, alcohol is quite high in calories, so excessive use of it can lead to obesity. Strong soft drinks containing caffeine. These include, first and foremost, strong black tea and strong organic coffee and popular energy today. From the last people who are prone to high blood pressure, is to be abandoned, and coffee and tea to brew is not very strong and add cream or milk. If you can't imagine my life without coffee, drink no more than 200 ml of drink a day (two cups). If you are a fan of salty, but suffer high blood pressure, you will have to reconsider the amount of salt you consume during the day. The fact is that a large amount of salt increases the sodium level in the body, which contributes to the arrest of fluid in it. This leads to edema, palpitations, irregular blood flow and result in hypertension. Daily salt allowance for a healthy person ranges from 4 to 15 grams. Patients with hypertension, doctors recommend to reduce this number to 1-2 grams.